Childhood is a beautiful time and it always inspires artists. Almost all the famous masters appealed to the image of children. 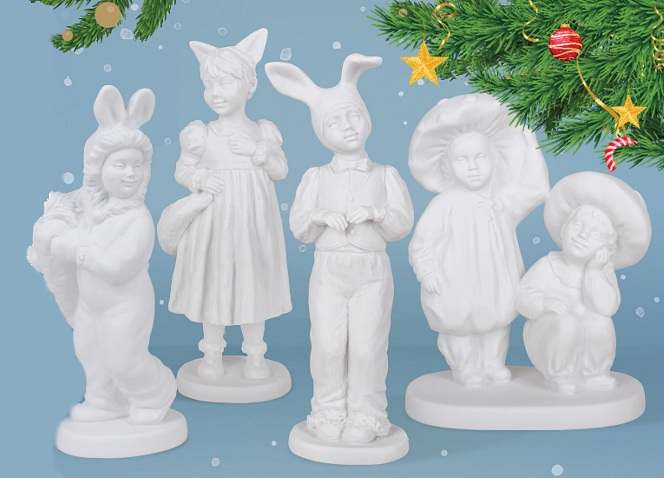 The richest collection of the genre sculpture by Lomonosov Porcelain Factory was enriched by 4 items executed in the form of charming porcelain figurines of children. Children are dressed in costumes of rabbits, foxes and mushroom. These items are made of biscuit porcelain in a realistic manner with great attention to details and cause a smile of emotion. Each sculpture has its own character and its individual, unique, expressive features - a small upturned nose, arched eyebrows or a dimple on the cheek. Matte velvety texture of the material gives the sculptures a special tenderness.